Two first-half strikes by an improving Bury sunk the Sky Blues deeper into the relegation mire – and 14 points from safety – despite a vastly improved second half display. Russell Slade’s tactical switch to three at the back at half-time, with Ryan Haynes frequently marauding down the left with skill and quality delivery into the box, left Sky Blues fans wondering why the change had not been made earlier. The system for the second half – which saw Jordan Willis switch to the centre of defence for Rawson – matched Bury who as Slade predicted played with three at the back. It suited Bury who were slicker and swifter with their passing and dominance in midfield, with their playmakers making use of the skiddy wet surface following deluge of greater Manchester rain. They created three good chances inside the first five minutes – a Caddis shot outside the box, a Vaughan header and a Caddis free kick that was blocked. They took a deserved lead on 15 minutes with a classy turn inside the box from James Vaughan, and a right foot low finish to Burge’s left, taking his goals tally to 19 for the season. A potentially mortal blow for Coventry City’s League One survival hopes came after 39 minutes. And it was a familiar tale of some poor marking. Bury’s 16-year-old starlet Styles was gifted too much space midway inside City’s half and he had too much time and space to pick out former Port Vale forward Tom Pope with a clinical through ball. Pope’s finish, again low to Burge’s left from just inside the box, was equally clinical. Prior to that, City’s only real impression on the first half came in a ten minute spell when Beavon broke on the left and nearly found Kwame Thomas in the box, but ex-City keeper Joe Murphy anticipated and advanced to gather the ball. A powerful Kevin Foley strike on target was headed away for a corner. 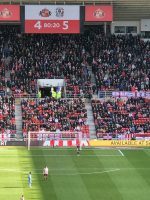 The tactical changes at half time – which also saw George Thomas make way for Dion Kelly Evans – saw City transformed, with Haynes putting on one of his best attacking displays for the club. His runs were followed by quality deliveries into the box into which midfielder Callum Reilly was making well timed and powerful runs. He had a string of chances, firing over the top on 50 minutes and narrowly wide on 53. Striker Charles Vernam, making only his second start following injury after his arrival in January on loan from Derby, also came into the game with two chances, including a header straight at the keeper from another excellent Haynes cross. And it was a Haynes cross that found Beavon – who had been holding up the ball well in the opposition penalty area on occasions in the second half – for City’s goal. The Slade signing from Burton firmly headed past the keeper’s right on 64 minutes to give hope to the 209 away fans in a crowd of 2,611. But despite City’s continued dominance, including a Reilly shot from outside the box tipped over the bar on 82 minutes and his sharp shot from closer range straight at Murphy, it was not to be. 82′ Great Reilly shot outside box. Saved Murphy, out for a corner. 74′ Again a good cross from Haynes for City. Didn’t drop for anyone in box. 69′ Coventry still dominant. Lots of possession down the left and through the centre. 64: GOOOAAALL; For Sky Blues. Beavon header in box from great Haynes cross. 2-1. 62′ Vernam has another chance for the Sky Blues after a cross from Haynes but heads straight at keeper. He and Reilly getting into good positions for Haynes’ service and Beavon coming more into the game holding the ball up in the middle up top. 53′ Another Reilly shot just wide of Burge’s right stick. Again from good work on the left. 50′ Reilly shots over the bar from edge of the box after good work from Haynes. That’s why he’s been brought on, as a marauding wing back. SECOND HALF: Ryan Haynes on as sub on left of defence. Jordan Willis switches to middle of defence. Rawson off. HALF-TIME ANALYSIS: Bury’s two goals make the Sky Blues’ fading hopes of survival even more unlikely. Bury were in control for large parts of the half, and playing the better football. They played much crisp passing football through the midfield and made use of the zip on a wet surface. The Sky Blues by comparison were laboured in possession in a decent 10 minutes before the second goal. They created three decent chances. The best of them fell to Callum Reilly who fired wide from inside the box. The first Bury goal by Vaughan takes him to 19 for the season, and you could see why. A real quality turn on the edge of the area and a low finish to Burge’s left. But there can be no excuses for the second Bury goal. 16-year-old Shakers starlet Styles was given acres of room through the middle to pick his through ball to former Port Vale man Tom Pope, who was also not marked closely enough and had time to curl his shot low past Burge’s left. 39′ GOAL. Bury striker Tom Pope with cool finish to Burge’s left from a through ball from Callum Styles. Too easy. Too much space through the centre. Bitter blow for Sky Blues. Game resembling Swindon defeat now. 37′ Sky Blues striker Kwame Thomas on target with a tame but clever midair backflick from a Willis cross on right. 34′ Decent 5 minutes of possession for Sky Blues. Finally in the game. 22′ First chance for Sky Blues. Beavon breaks on left and crosses for Kwame Thomas at back post, but former Sky Blues keeper Joe Murphy anticipates and gathers. 15′ GOAL. Great turn and right foot shot in the area by James Vaughan for Bury. 1-0. 9′ Blessed few minutes of Coventry possession witout penetration or chances. A few passes going astray in the final third. 3. 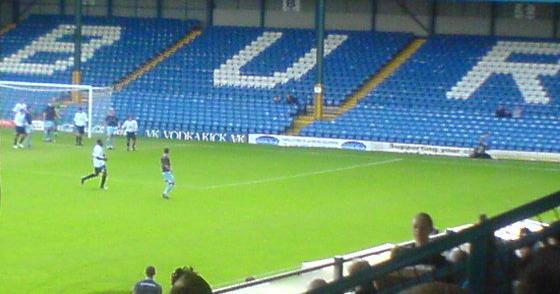 CHANCE; Bury’s Vaughan heads straight at keeper. All Bury so far. Teams on the pitch. Decent old fashioned ground. Pitch looks heavy from rain. Sky Blues in black and red away kit. A hundred or so Sky Blues fans visible so far to my left from the press box behind the goal. Thirdly, its good (not grim) up north. Official car parking here is free. It was £3 at Oldham. A tenner charged by our dearly beloved insect landlords back home. Secondly, anyone who made it here from Coventry.. congratulations. You survived. Driving rain all the way up the motorway. Invisible conditions. Curiously, it only stopped raining as I drove past Manchester. Sky Blues captain Jordan Willis comes in at fullback, and Charles Vernam makes his second start for Coventry after a month of being sidelined through injury. The Sky Blues boss makes four change. Farrend Rawson comes in at the back, and Vernam is expected to play out wide. Jordan Willis replaces Dion Kelly-Evans at right-back, with Jordan Turnbull on the left in place of Ryan Haynes. Stuart Beavon will play up front with Kwame Thomas. Coventry City: Burge (GK), Willis, Clarke (C), Rawson, Turnbull, Foley, Reilly, Vernam, G.Thomas, Beavon, K.Thomas. Subs: Charles-Cook (GK), Haynes, Kelly-Evans, Rose, J.Jones, Reid, Tudgay. Bury: Murphy (GK), Leigh, Burgess, Pope, Mellis, Barnett, Moore, Styles, Beadling, Caddis, Vaughan (C). Subs: Lainton (GK), Mayor, Maher, Hope, Miller, Pennant, Lowe. Welcome to our live blog from the press box at Gigg Lane, Bury, for this latest crucial game in Coventry City’s relegation fight. The Sky Blues are desperate for 3 points, with 13 games to go. They are bottom of League One, 11 points below safety and five places below an improving Bury side, but with a game in hand.